Do you know these secrets of the “Little Castle”? On the 50th anniversary of the Berkeley City Club Conservancy, we celebrate our partnership with the City Club and express our gratitude to all the donors, Club members and non-Club members alike, who contribute so much time, money and expertise to preserve Julia Morgan’s magnificent Berkeley City Club. If you are not one of our donors, we encourage you to become one and to ensure that the City Club continues to provide a place for people to celebrate life’s milestones; to enjoy concerts, plays, lectures, and book discussions; to dine, swim, and socialize. This is a building that rewards observation. Julia Morgan included many grace notes and discovering them is always a delight. It may be the way light enters a particular room at a certain time of day. It may be the creatures that embellish fireplace surrounds. There is always something to soothe your spirit and lift your heart. We hope these questions give you an opportunity to look more closely and to (re)discover the Berkeley City Club. The nonprofit now known as the Berkeley City Club Conservancy has had other names during its 50 years of existence. What were they? The Berkeley City Club Foundation was incorporated in 1965 with broad objectives that included many philanthropic activities. Over the years its mission became more focussed on the preservation of the City Club building and in 1983 its name was changed to the Landmark Heritage Foundation. The Berkeley City Club Conservancy name was adopted in 2013. 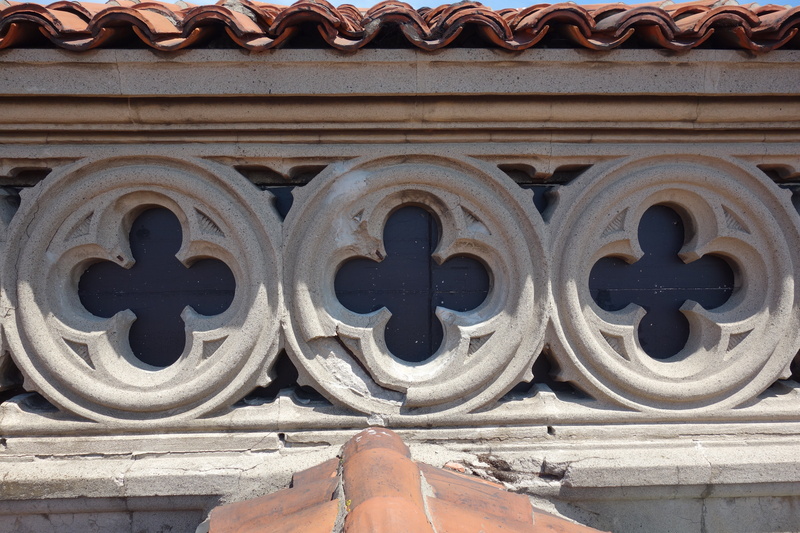 Under each of these names the Conservancy has striven to maintain the structural and architectural integrity of Julia Morgan’s “Little Castle”. Many of the column capitals in the Club combine acanthus leaves and flowers. But there are others that include birds, grape clusters and even seahorses. Where are those located? Birds can be found in the capitals of the columns that flank the entranceway to the City Club as well as those in the West Court. 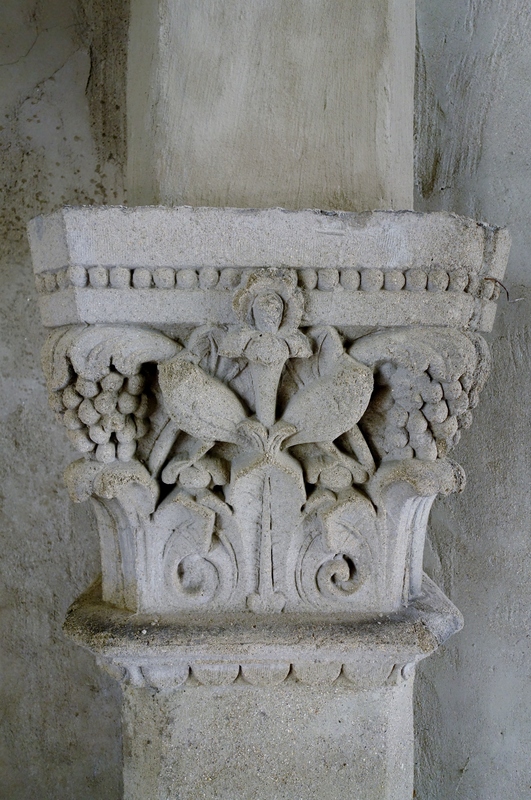 The West Court capitals also feature grape clusters. Seahorses are featured in the columns that surround the pool. The lanterns that were originally placed in the pool have been dispersed – and reproduced. Where can they be found? The lanterns that were originally used to illuminate the pool had to be moved because the humidity was causing them to deteriorate. 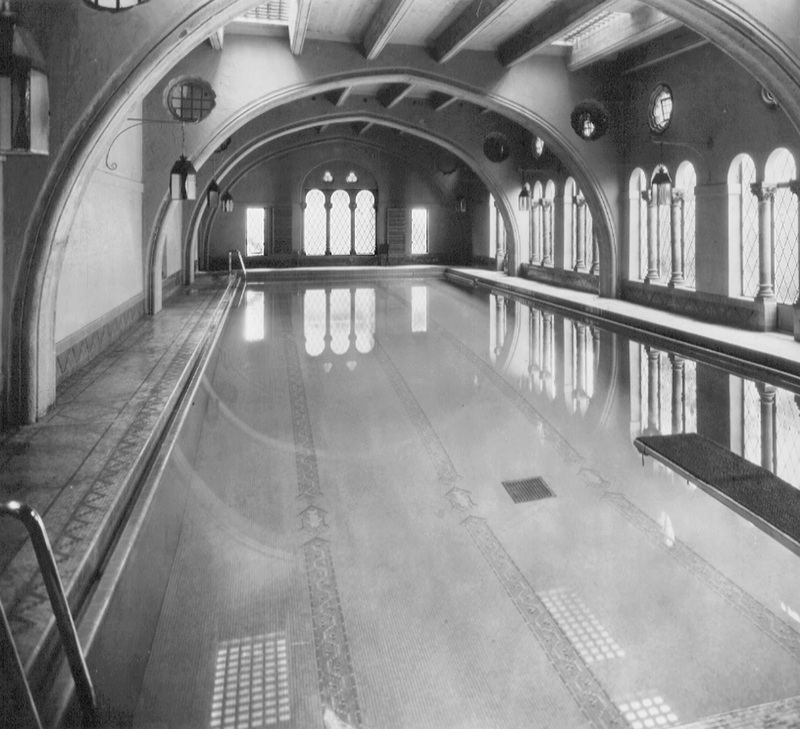 Historic photo of pool showing original placement of lanterns and reflection of skylights in pool. and at the Coffee Corner. 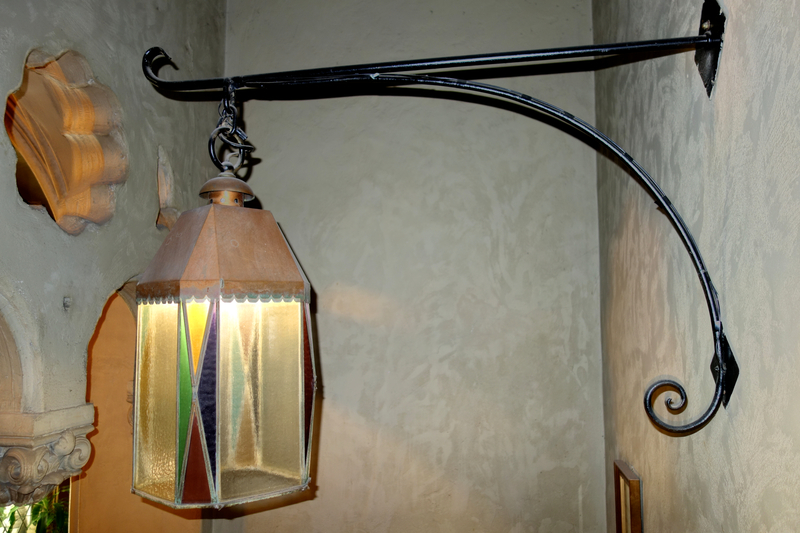 The Conservancy funded the restoration of one lantern and the fabrication of replicas in 2015. 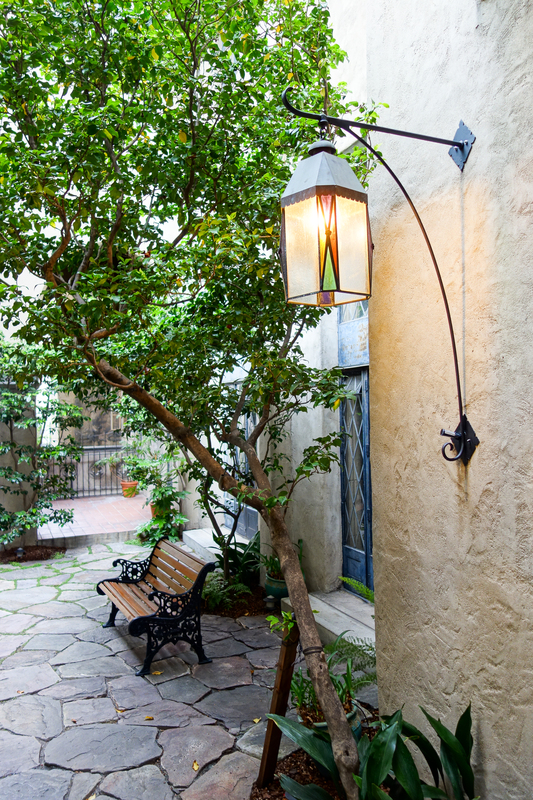 Thanks to the efforts of Conservancy Board member Gary Samonsky and Jana Olson of Panache Lighting the restored lantern and the replicas now light the West Court. Humidity in the pool area has been a problem since the construction of the building. Julia Morgan proposed a ventilation system in 1933 to ameliorate the problem. The system that the Conservancy and the City Club are currently implementing is based on Morgan’s design and includes a large fan installed under the viewing gallery at the south end of the pool. What is spalling? How does concrete become spalled and how can it be repaired? Spalling is the breaking off of fragments of material from a larger solid body. Steel-reinforced concrete can become spalled when water penetrates the surface and causes the rebar to rust. The rebar expands, pushing the concrete out. The concrete cracks and the fragments that break off are called “spall”. Spalling can be seen in this photo of the elevator tower. The repairs undertaken at the City Club to repair spalled concrete have involved removing the concrete and either cleaning the rebar of rust or, if necessary, cutting it back and replacing it. The concrete is then patched and a waterproof coating is applied to prevent future problems. Spalling has affected many areas of the City Club. The south facade of the building was repaired in 2010-2011 (see middle of page at http://berkeleyheritage.com/awards/awards2012.3.html) in a massive project that also included replacement of the pool filters, the restoration of the original elevator and the addition of a second elevator. 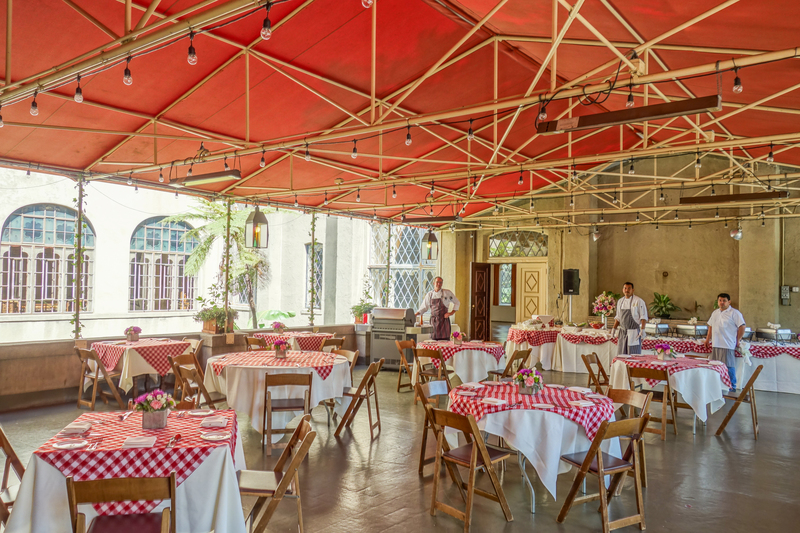 The funds used for these projects included a grant from the California Cultural and Historical Endowment ($381,000), money donated to the City Club Conservancy and money from the deferred maintenance accounts of the Berkeley City Club. The filters are an essential part of the pool system, even though we seldom see or even think about them. 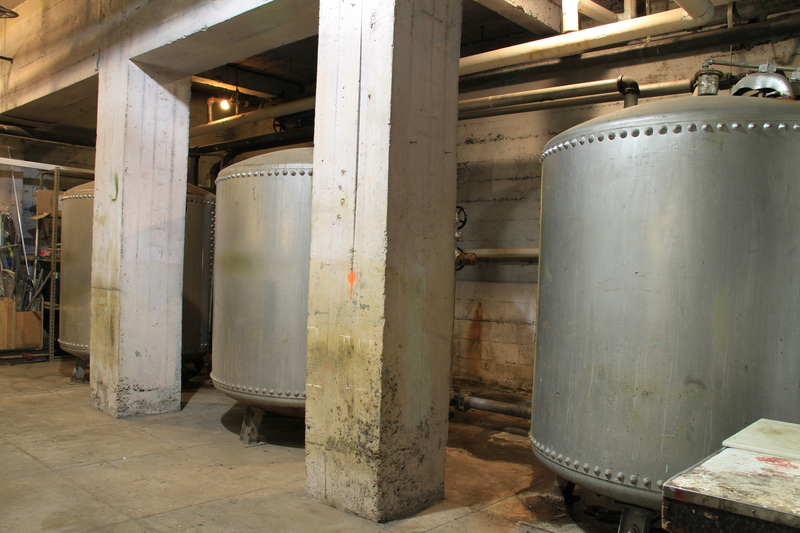 After 80 years of use, the original filters were replaced with stainless steel energy efficient filters. How much water passes through them each day? What is the filtering mechanism? The pool contains approximately 80,000 gallons of water. The water passes through the filters approximately 3.5 times per day. So the answer to our math quiz is 280,000 gallons. The original filters installed in 1930 were the same type used by Morgan at San Simeon: rapid sand filters. There were three, each six feet tall and six feet in diameter. The seams at the side and the top were riveted closed. There was a hatch at the top to permit replacement of the sand. 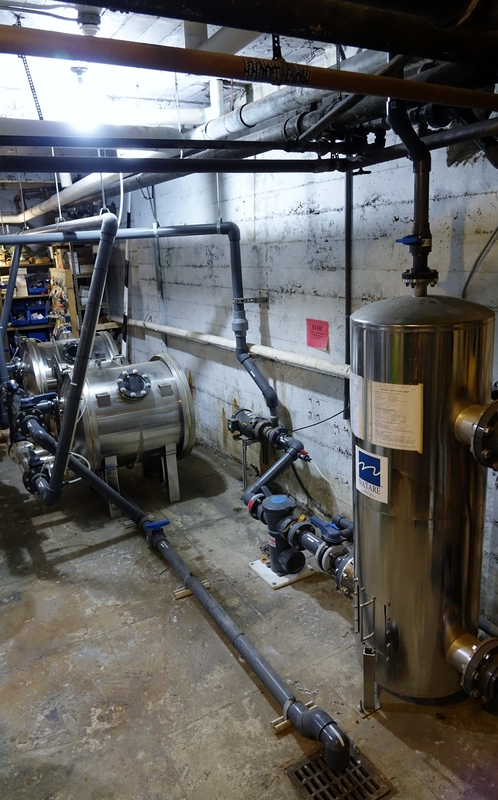 Two high rate sand filters manufactured by Natare Corp. replaced the old ones. In addition to the stainless steel filter tanks, there’s a surge tank – a storage tank that mitigates pressure variations caused by rapid changes in water velocity. There were environmental benefits from the replacement of the filters: the new filters save water, use less energy to heat the water, and reduce the amount of chemicals needed to treat the water. 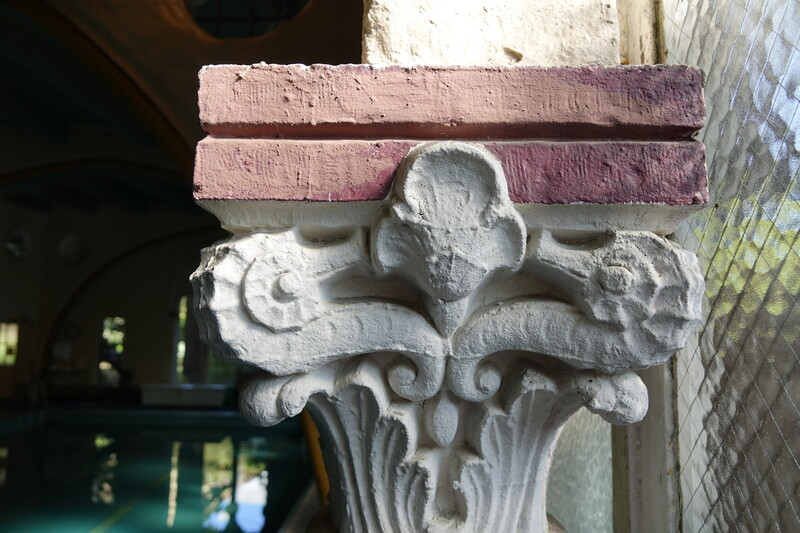 Some years ago Julia Morgan’s original drawings for the building were discovered. Where were they found? Where are they now? Mary Breunig found the drawings forgotten on a shelf in the basement. The drawings were scanned and the originals were donated to the U.C. Berkeley College of Environmental Design Archives. Photos (except for historic photo of pool) by Trevor Johnson.